*Editor's Note: This biography was presented by the National Mining Hall of Fame and Museum in Leadville, Colorado. All inductees into the National Mining Hall of Fame who worked in Alaska or contributed to the development of mining in Alaska automatically become members of the Alaska Mining Hall of Fame. “C.J.” Berry was one of the great pioneering mining men who penetrated and developed the nation’s frontiers. Berry invented the steam point, which revolutionized placering of the permafrost in the Klondike. He introduced hydraulic mining and bucket line dredging near Fairbanks, Alaska and organized the very successful C.J. Dredging Co., which operated profitably for many years in Mammoth Creek. 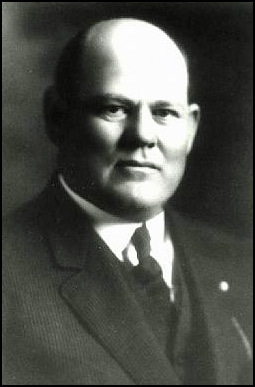 He found oil in California, forming the Berry Petroleum Company, which became the third largest independent oil company in the state. In 1894 Berry arrived in Juneau, Alaska and joined a group of 40 men headed for the Yukon Territory; he alone arrived at the destination, Forty Mile. He prospected and mined, gaining experience in Arctic and sub-Arctic conditions. With the Klondike gold discovery in 1896, Berry and his partners acquired claims on Eldorado Creek. He used wood fires to thaw the ground and removed the thawed material by hand shoveling. He hit it rich at 12 feet. Returning to Seattle in 1897, he was among the first to bring “hot” news of the Klondike discovery to the continental United States. Once again in the gold fields, Berry realized firsthand the hard work, time-consuming effort and danger of working the confined areas around wood fires. He was determined to find a better way of thawing the permafrost. Using steam from a steam-driven hoist engine, a hose, a small diameter pipe and rifle barrel, he invented the steam point. Later, he introduced electric lights to Arctic mining, utilizing a 25-horsepower engine and boiler for night work. A native of Selma, California, he returned to his home site to invest in California real estate and found oil. Berry also had extensive mining holdings in Mexico but his gold and silver properties were expropriated by the government. He also worked mines in Elko County, Nevada. His monograph, The Experiences of Clarence Berry in the Yukon, testifies to his accomplishments. He was cited in numerous references in books and articles published over a period of 90 years.